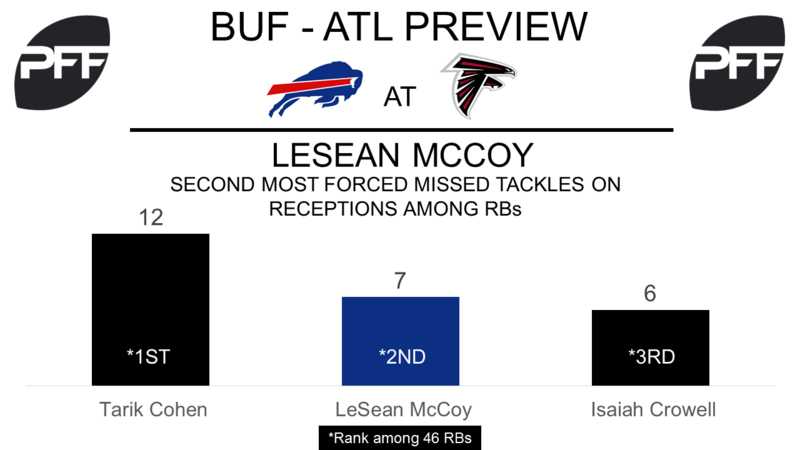 HB LeSean McCoy vs. LB Deion Jones – One of the best receiving running backs will face off against one of the best coverage linebackers on Sunday. McCoy has the seventh best receiving grade among runners this season with a grade of 85.7 and he has forced seven missed tackles on his 18 receptions, the second most by a running back. Jones has the 11th best coverage grade among linebackers this season with a grade of 83.3 , when targeted this season Jones is giving up a passer rating of 98.9. He has allowed 64.7 percent of his targets to be caught. T Jordan Mills vs EDGE Takkarist McKinley – Despite a poor overall grade, Mills has been good in pass protection, earning a pass block grade of 74.1 which ranks 23rd. He has only given up five total pressures on his 102 pass-block snaps for a pass-blocking efficiency (PBE) of 96.1 which ranks 20th in the NFL. McKinley represents a challenge however. His pass-rush productivity (PRP) of 11.1 is the third highest among rookies (PRP/PBE measures pressure created/allowed on a per snap basis with weighting towards sacks). QB Tyrod Taylor vs. CB Desmond Trufant – Grading as the fourth-best quarterback so far this season with an overall PFF grade of 85.4, Taylor is having a superb season. Taylor is one of the most accurate signal callers in the NFL, ranking fourth with an adjusted completion percentage of 80.3, predominantly shining from a clean pocket with the third highest adjusted completion percentage of 84.3 percent. Trufant is the 15th highest graded cornerback with an overall PFF grade of 83.2, he is currently being targeted once every 12 cover snaps, the fourth-best mark among cornerbacks in the NFL this season. WR Julio Jones vs. CB E.J. 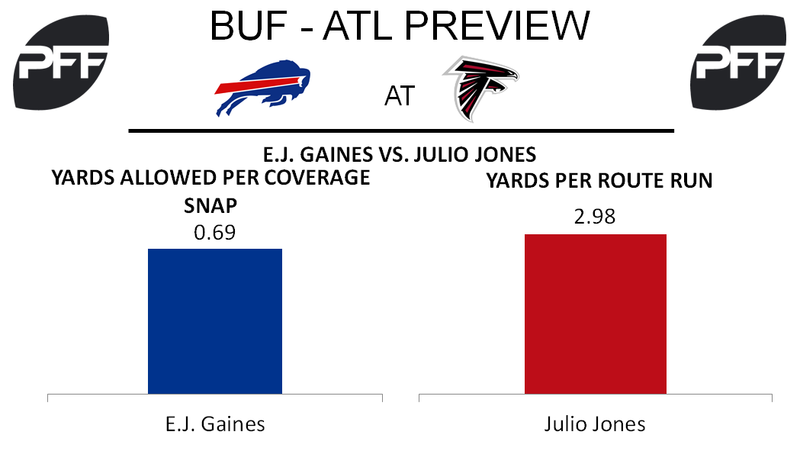 Gaines– So far this season, fourth-year cornerback E.J. Gaines is playing some of the best football of his career. Gaines currently ranks tied for 14th in overall grade among cornerbacks with a grade of 83.2 through three games. The former member of the Los Angeles Rams will be in for his biggest challenge of 2017 to date as he has a matchup with Falcons receiver Julio Jones this Sunday. Jones has picked up right where he left off in 2016 after leading the NFL in yards per route run. The receiver enters Week 4 ranking fifth in the NFL averaging 2.98 YPRR. HB Devonta Freeman vs. LB Preston Brown– Running back Devonta Freeman has been one of the more elusive backs in the NFL this season. His forced missed tackles are ranked fourth among running backs on run plays, and his elusive rating of 44.1 is ranked 14th. Freeman will be chased around by linebacker Preston Brown on Sunday. Brown has graded well with an overall grade of 77.6, but has had some trouble in run defense. Brown currently ranks 45th out of 53 qualified inside linebackers in run-stop percentage at a rate of 5.0 percent. G Wes Schweitzer vs. DI Kyle Williams– One way the Bills can help slow down Devonta Freeman in the running game is by having defensive tackle Kyle Williams make plays up front. Williams is tied for eighth among defensive tackles in run-stop percentage at 12.5 percent. The 12-year veteran will be lined up a number of times against right guard Wes Schweitzer. Schweitzer won the starting job in preseason and has been coming along slowly so far this season. Through three games, Schweitzer ranks 41st among guards in run blocking with a run block grade of 44.1.